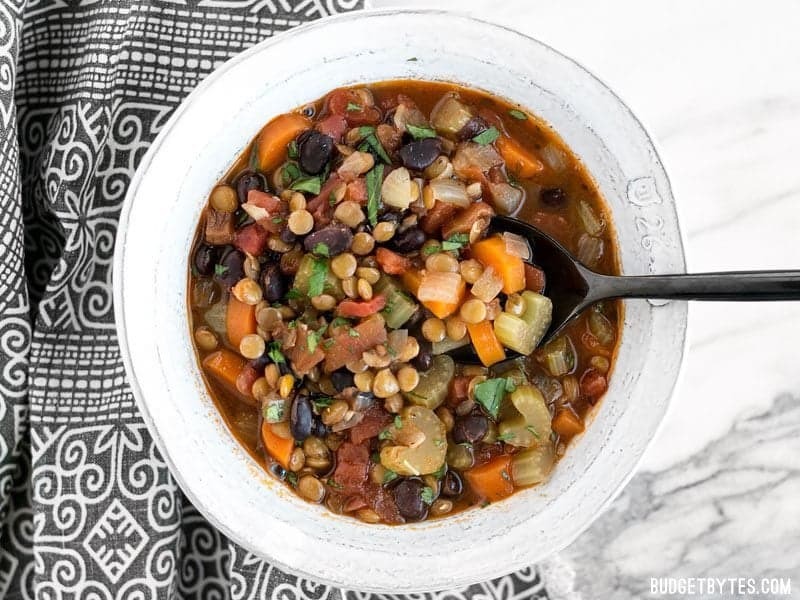 OMG… This Chunky Lentil and Vegetable Soup is my new all-time favorite soup! I’ve already eaten two bowls since I made it today at lunch and I don’t think I’ll even need to freeze any because it will be gone fast. 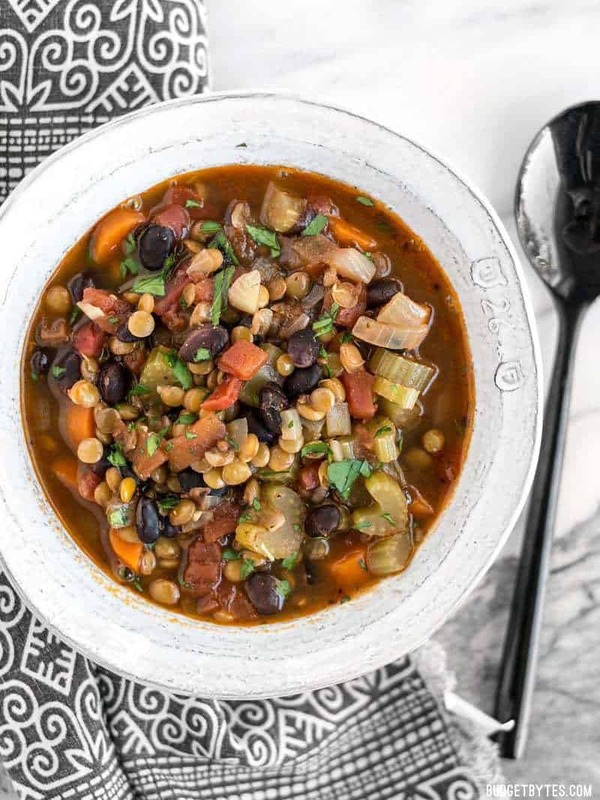 This super flavorful and hearty soup is a vegetarian take on the old classic Lentil & Sausage Stew from way back in 2010. I replaced sausage with black beans, added some tomatoes for brightness, and nixed the spinach. 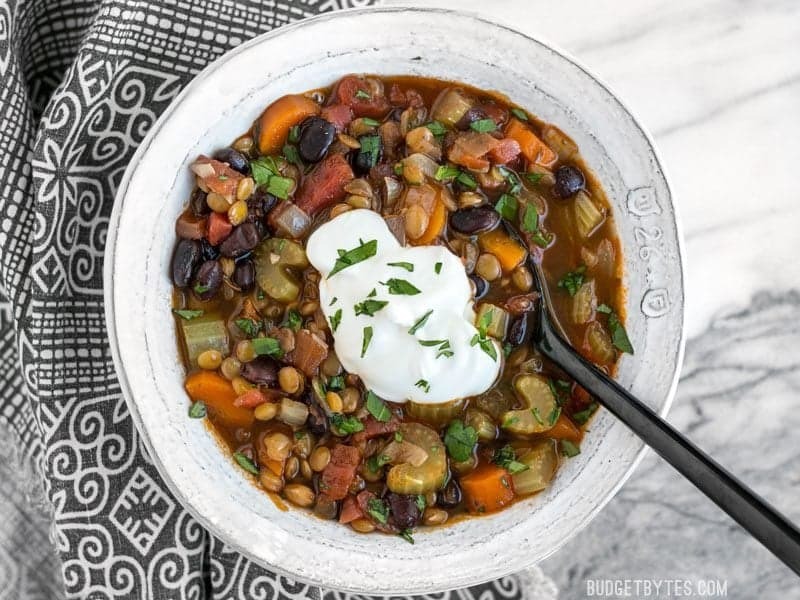 The black beans help make everything thick and creamy and the blend of herbs and spices just can’t be beat. It’s soooo good. So many colors, flavors, and textures in one bowl, and super cheap, too! The best part? I already had most of the ingredients on hand, so when I went to pick up the remaining items my total bill was about $3. It pays to shop in your pantry before you shop in the store! 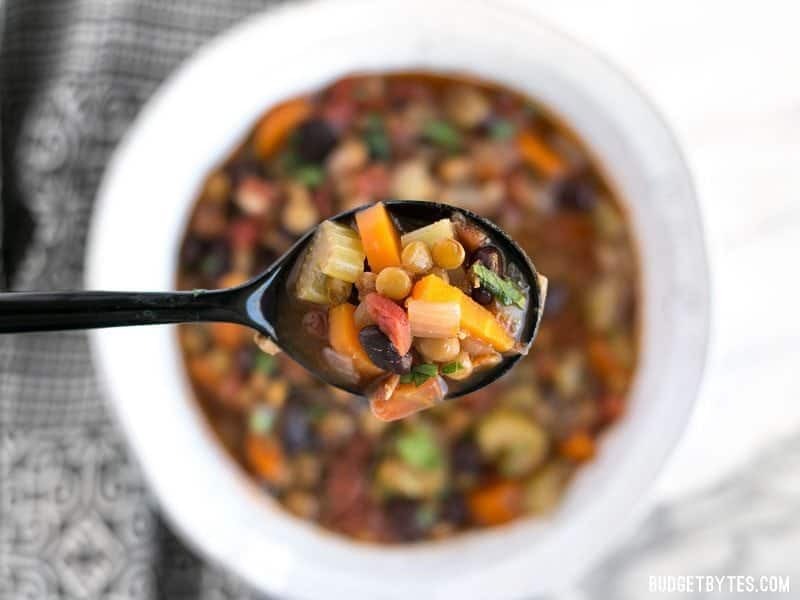 A little dollop of sour cream is SO GOOD on this Chunky Lentil and Vegetable Soup. Mince two cloves of garlic and dice one onion. 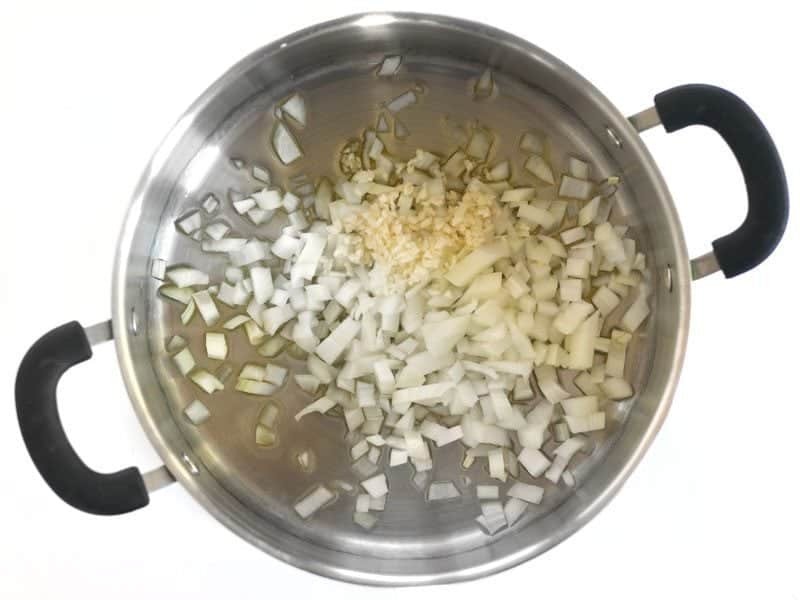 Sauté both in a large pot with 2 Tbsp olive oil over medium heat until the onions have softened. While the garlic and onion are cooking, clean and slice 1/2 lb. (3-4 medium) carrots and 3 ribs celery. Add them to the pot and continue to cook for about 5 more minutes. 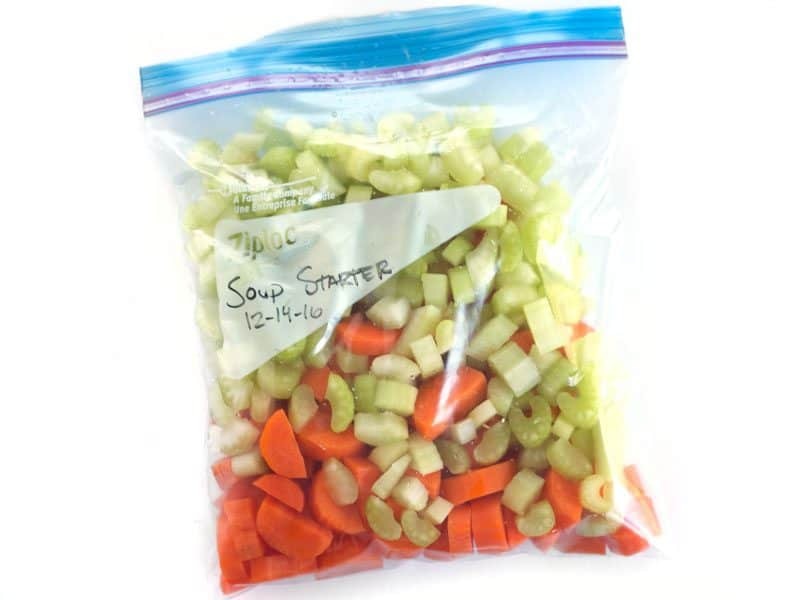 Most of my soups start with 1/2 lb. of carrots and 3-4 ribs of celery, so instead of just letting the other half of each go limp in the fridge, I go ahead and slice them up then freeze them for the next soup. 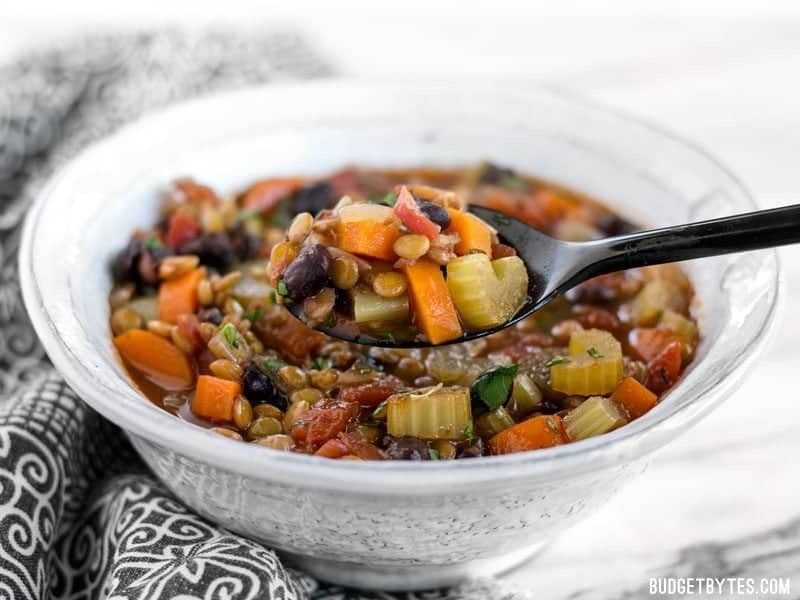 Once the carrots and celery have cooked a few minutes, add 1 cup dry brown lentils, one 15 oz. 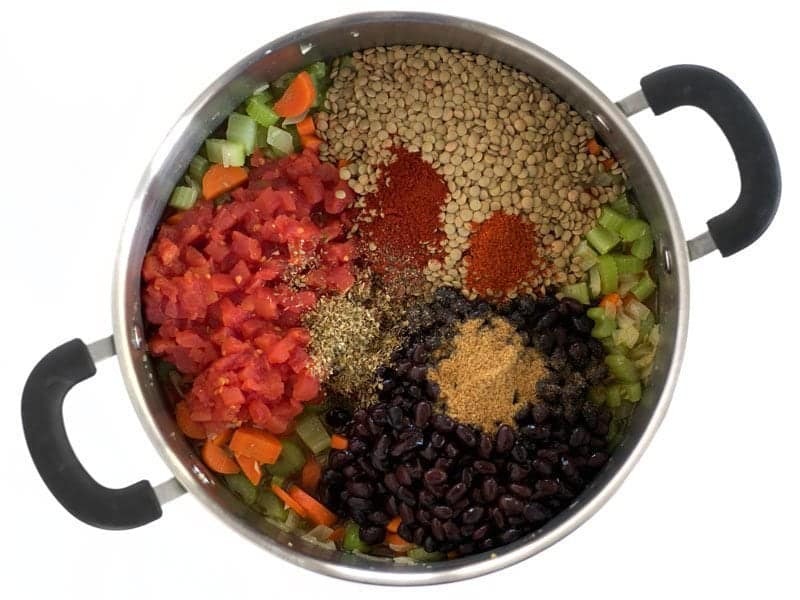 can black beans (drained), one 15oz. can diced tomatoes (with juices), 1 tsp cumin, 1 tsp oregano, 1/2 tsp smoked paprika, 1/4 tsp cayenne pepper, and some freshly ground black pepper (about 10-15 cranks of a pepper mill). Stir to combine. And 4 cups of vegetable broth. Stir well. Increase the heat to medium-high and let it come up to a boil. 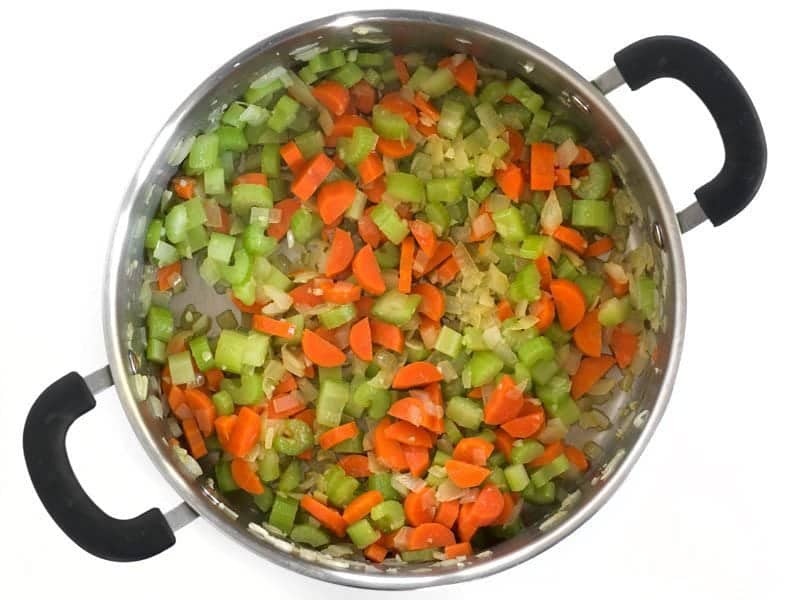 When it reaches a boil, turn the heat down to low, place a lid on top, and let it simmer for 30 minutes. After 30 minutes, test the lentils to make sure they are tender. 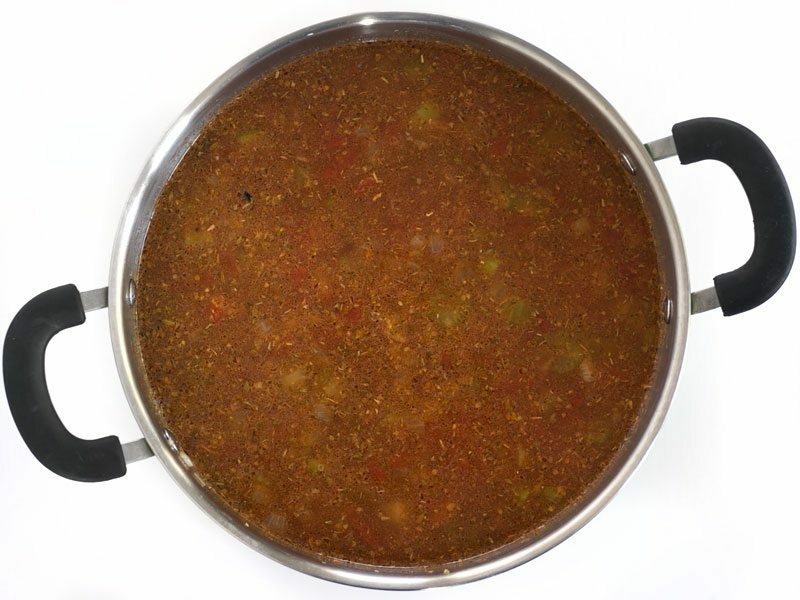 If you have green or French lentils, they may need to simmer for 45 minutes or so to fully soften. Also taste the soup and add salt if desired (I added 1/2 tsp of salt). Now it’s ready to serve! This recipe is great! I love the blend of spices in this soup. I had a sweet potato that was on its last legs and added it to the soup as well. I served it with a dollop of greek yogurt on top and some crusty bread. I imagine this recipe could be a great way to use up many different veggies you might have lying around. Will definitely be making again! Probably, although I’ve never tried it. So- sorry if this is a repeat question. Pressure cooker? Can you just pressure cook this whole thing into an amazing yumminess? I’ve never cooked with a pressure cooker- any tips? I haven’t tried it, but I bet you could! 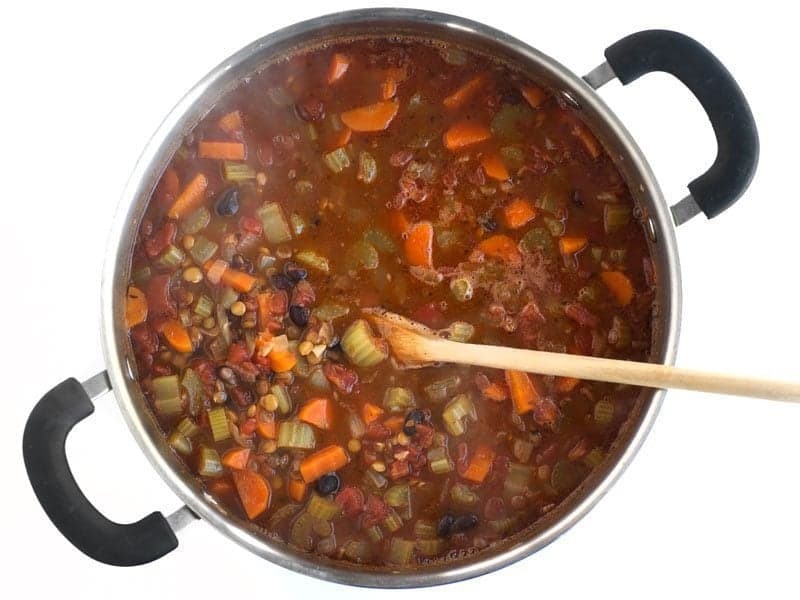 It should cook very quickly since both vegetables and lentils (depending on which type you use) cook fairly quickly even on the stove top. I made this last night, using half the amount of cayenne (my mother does not like spicy food). So filling and delicious. With three generations living together, everyone adds their own twist at the table. My mom added crackers and sour cream, my son and daughter cheese and my husband red pepper flakes. I served it with rolls and fresh fruit. My meat eaters did not complain and everyone liked it. Budget bites has become my “go to” for new recipes that are healthy, affordable and not too complicated. This is a staple in our house, and it has been for a while. A friend of mine tried it and has used it in his catering business, too. Even my mother, who hates soup (who hates soup?!?!) really enjoys this recipe!! Today, when I made a pot of this, my head wasn’t in my cooking, and after it was too late, I realized I had added a teaspoon of chili powder, thinking it was smoked paprika. And then I added a whole teaspoon of smoked paprika, because again I wasn’t looking or thinking (recipe calls for half a teaspoon of that). I’m writing to you to tell you that if you add a teaspoon of chili powder, this is still really good soup. So let’s call it an “alternative” version of this soup. :)Thanks for your consistently good recipes. My husband and I are especially grateful for the numerous ones you post without meat. Great tasting- super quick mid-week meal. I added fresh spinach and a smoked turkey kielbasa (feeding a teenage boy). Ive made this a few times now and we love it! I made a few changes, i added ground spicy italian sausage and sliced spicy italian sausage. Both cooked then dumped into the pot as its simmering. I just made this, and it is awesome. I am not usually a soup person, but LOVE this. First off, thank you for the excellent website! Secondly, can I just say “nom, nom, nom”?! I made this almost exactly per the recipe. Used Wyler’s Chicken granules (3 tsp for 4 cups broth) and regular instead of smoked paprika (because that’s what I had). I was worried about the cayenne, so stared with 1/8 tsp, but ended up adding the full 1/4 tsp – glad I did! Just enough kick. Topped it off with a little shredded pepper jack cheese. Can’t wait to have it for lunch tomorrow as well. Vit A 107% (! ), calcium 6%, Vit C 19%, Iron 18%. Forgot to add, I omitted the extra salt. It was plenty salty for my taste. Also forgot to rate – doh! I don’t know how to cook but I tried this recipe at my neighbor’s house for fun to cook for 3 other people and it turned out really well. They loved it and I liked it too and I took the leftover home for another person and they liked it as well. It has a lot of ingredients but its a really good recipe. Just made this and cannot praise it enough!! Sooo flavorful with wonderful texture. I just added a little extra cayenne and used green lentils instead of brown. I will definitely be making this quick, cheap, and heavenly soup again. Thank you! Excellent recipe that’s deliciously warming. Thanks again Beth! I wanted a bit of meat in mine and subbed the black beans for Albondigas (Mexican Meatballs) formed into bite-size balls that I pan-seared on each side before letting them cook the rest of the way in the soup. Somewhat more effort, but so worth it. PS. If anyone in Asia has trouble finding the lentils mentioned, Toor Dal (Split pigeon pea) is an excellent substitute that cooks in more or less the same amount of time as the recipe states.